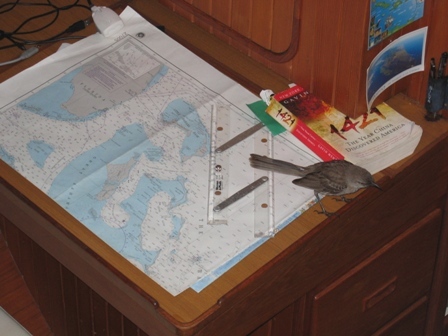 During the two day sail from Nassau, Bahamas to Fort Pierce, Florida, we had a little stow away for a couple of hours. The little guy actually even flew down and walked over me while I slept. He was good company for Marco during his shift. 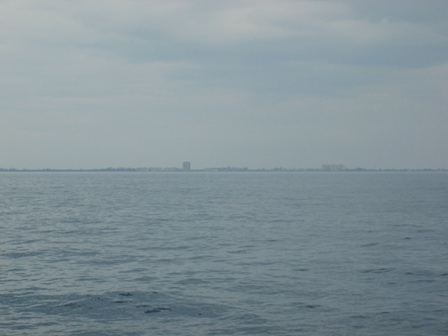 We were also treated with quite a few visits from Atlantic Bottlenose Dolphins along the way back to the US. Fort Pierce, Florida, our first site of the United States after being away a year!!!! As one of the oldest communities on the east coast of Florida, Fort Pierce has borne witness to the changing tides of history - as well as the changing tides of the Atlantic Ocean - for over 104 years. Although it was incorporated in 1901, Fort Pierce's history begins in 1837 during the Seminole Indian War. U.S., where Army Lt. Col. Benjamin Kendrick Pierce established the original fort used as the army's headquarters. After seven years of raging war, the Seminoles took refuge in the Everglades in 1842. This event left Fort Pierce free to develop as a permanent settlement. Water transportation, fishing and canning of fish were key to the area's early economy. Pineapple was also once king, but was replaced by citrus due to the favorable climate. As the city matured and with the advent of the railroad, Fort Pierce developed into the economic commercial hub of the Treasure Coast. Today, Fort Pierce, a city of 36,000 residents and 17 square miles, is rich in history, and continues its reign as the area's commercial center. Fort Pierce is also the site of three major hurricanes within 2 years: Hurricane Frances, Hurricane Jeanne, which both hit the city by the eye, and Hurricane Wilma. Before we could enter the anchoring point off Faber Point we had to go under a bridge that we knew was 65 feet tall in the center. We felt pretty comfortable going under it since we thought our mast was only 55 feet. Seconds before going under the bridge we realized that it was much closer. 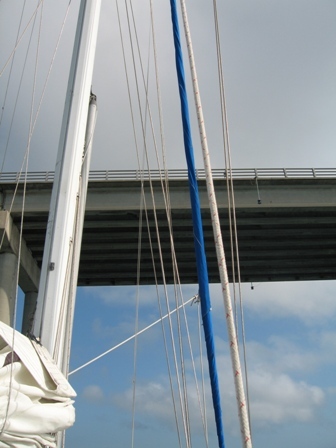 When we rechecked the specifics our mast was 55 feet from the deck but 63.5 ft from the waterline. Close one!!! 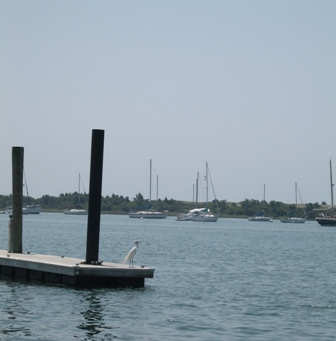 We chose Fort Pierce for our first US landing because it was a Port of Entry and Customs/Immigration was located there. 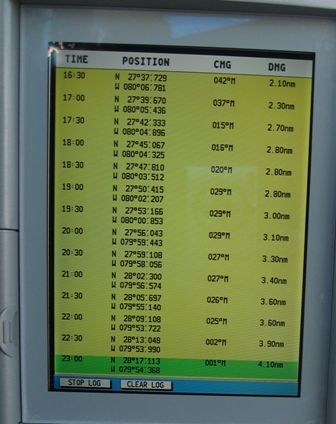 After calling the 1-800 number to clear in we were instructed to go to the airport for final processing. The whole process was quick and easy and now we felt like we were back! 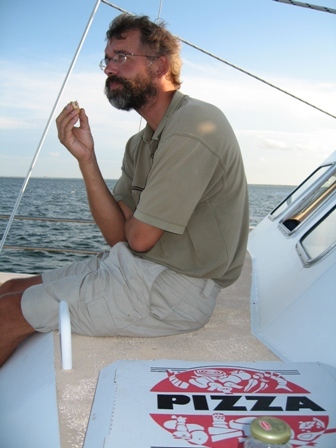 When we departed Fort Pierce we experienced a soft grounding in the channel off where we anchored. A Good Samaritan pulled us off thank goodness but between the grounding and the bridges both of us were a little anxious to travel in the Intra Coastal Waterway once we reached Beaufort, North Carolina. Stay tuned for those experiences!!! 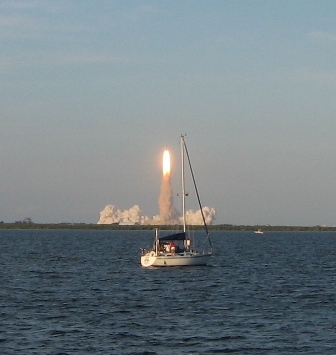 Another reason we chose Fort Pierce, was that it was a days sail away from Cape Canaveral, where the Space Shuttle Atlantis was scheduled to lift off on June 8th. Unfortunately, the forecast on the 7th for the Fort Pierce area was extreme thunder and lightning storms with a chance of a tornado so we decided to rent a car and drive to Cape Canaveral on the 8th instead of sailing there. 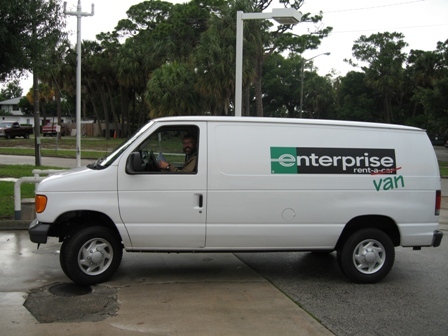 When we arrived at Enterprise Rent A Car, they were having a deal that day on a PT Cruiser as an upgrade to a compact car or a van. Despite that they were offering the PT Cruiser for almost free, we still had our pride. As were driving north on I-95 we figured out that if we just kept driving we could be back in Barrington in 24 hours. It was such a weird feeling for us. This was the first time that home really started feeling close. 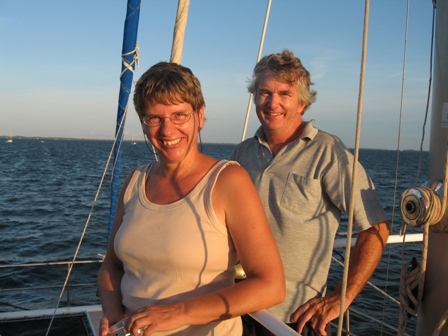 Once we arrived in Cape Canaveral, we called Pelagic on the radio and Graeme picked us up in his dingy and took us out to their beautiful steel catamaran that they had designed themselves in Australia. We then picked up anchor and headed to the launch site where we were able to get as close as possible by boat to take in the launch. Graeme and Iris aboard Pelagic anchored off launch pad 39A, where Space Shuttle Atlantis was scheduled to launch. Marco eating pizza as we waited for the count-down for the launch. 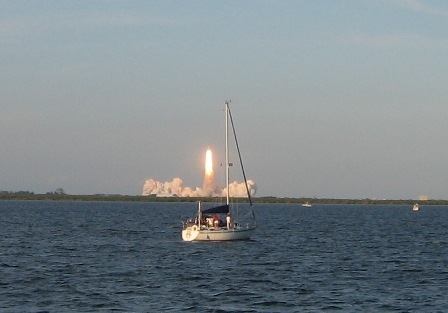 The launch of the Space Shuttle Mission STS-117 aboard the orbiter Atlantis took place on a beautiful evening at 7:38 p.m. 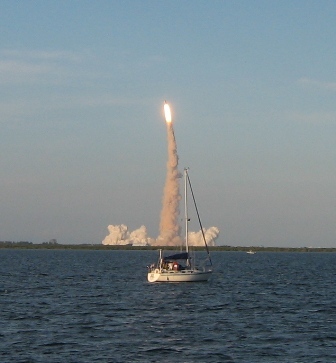 The launch was an incredible event to see, something every person should see at least once in their lives!!! We couldn't believe how bright the flame was, it was equivalent to a welders arc, and painful to directly look at for any length of time. It actually took about 15 seconds for the sound to reach us. Once it did, there was a deep, loud rumble palpable in our chests, and actually caused the boat to shake. 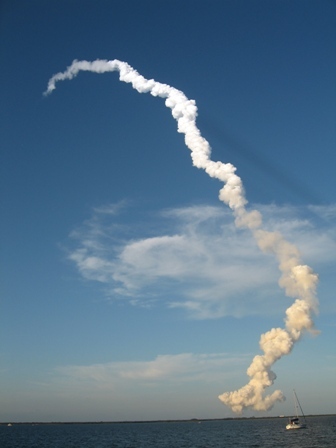 The smoke plume from the boosters after the lift-off. It was fascinating to see the different colors associated with the fuels being used to power the shuttle. The first smoke was a rich yellow-grey color and once the hydrogen fuel took over the plume became pure white. The shuttle did not go straight up, it ascended at an angle to leave the Earth's atmosphere. We want to thank Graeme and Iris for hosting us during this incredible event. It ended up being one of the highlights of our Epic Adventure!!!!!! 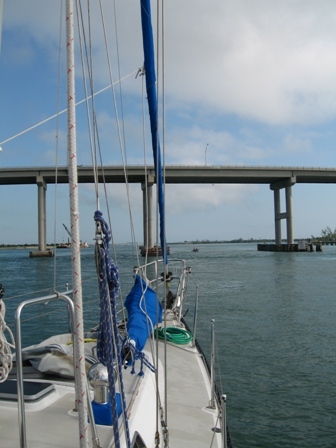 On June 9th we departed Fort Pierce, Florida and started a two day sail to Charleston, SC. 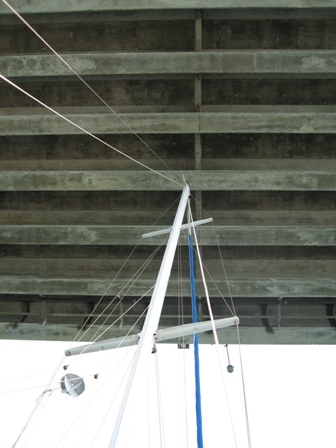 We decided to take some pictures of going under the bridge at Faber Point in Fort Pierce so that we could see just how close our mast came to the bridge. The second time going under was a little less nerve racking than the first put you can see why we were nervous the first time! It looks tall enough to go under. Well maybe not as tall as we initially thought. Our two day sail to Charleston was a lot of fun and fast!! 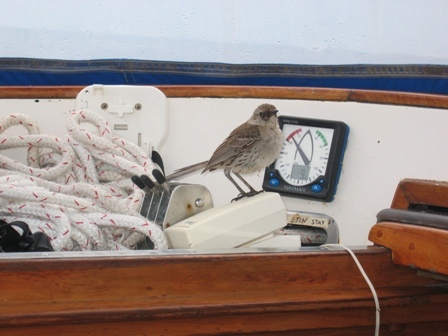 It was sunny out and we had a pretty steady wind out of the SW of about 15 knots. The Gulf Stream, which is essentially a fast moving river of warm water within the ocean, at times added 3 plus knots to our speed. You can see how our 30-minute speed average from our Chart Plotter increased as we progressed into the Gulf Stream . 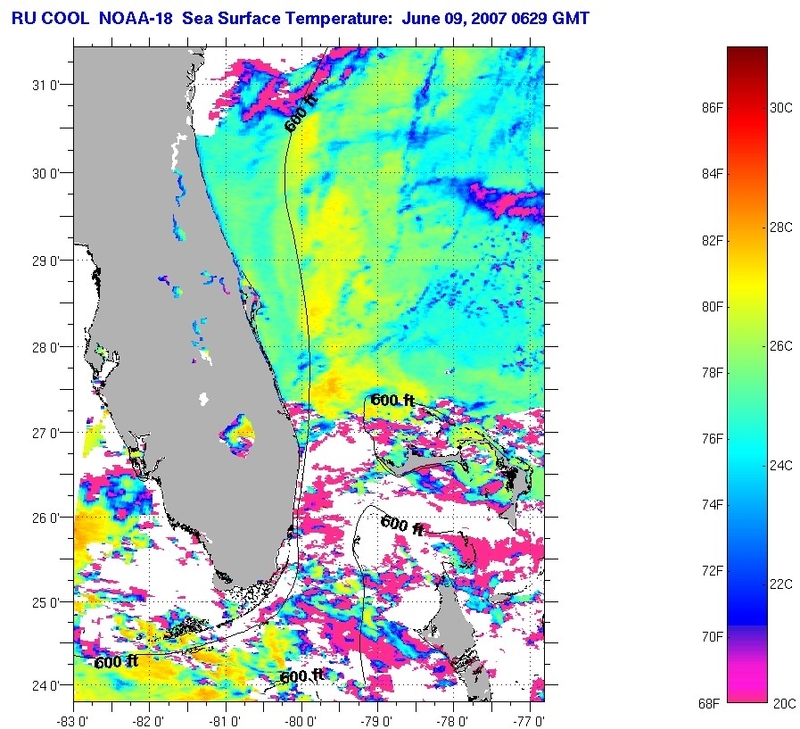 We had downloaded infrared satellite pictures of the Gulf Stream from the internet. With our GPS position linked to a chart plotter with detailed electronic charts, we could follow the fastest currents in Gulf Stream. We paused to marvel at the modern technology available to us today. Here is the satellite image from Rutgers.edu showing the position of the Gulf Stream. The 600ft. depth line contour is also drawn in, which in this case follows the western limit of the Gulf Stream. 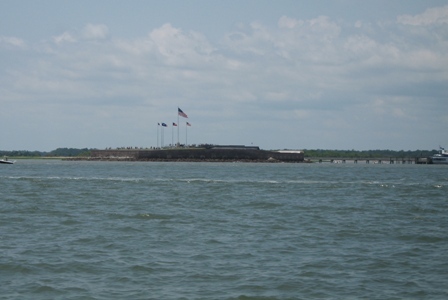 As we approached Charleston we sailed by Fort Sumter, the site of the Civil War's first battle. Charleston seen as we approached from sea. 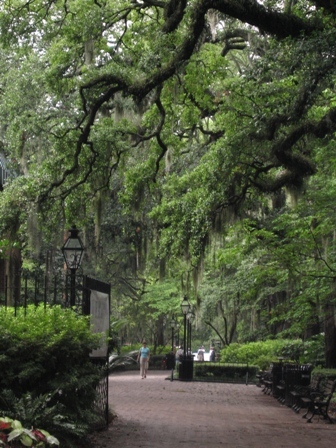 We would soon find out that Charleston is the Deep South with palmetto trees, southern cooking and south colonial architecture. South Carolina's harbors led to the development of a wealthy society, rich in American history. 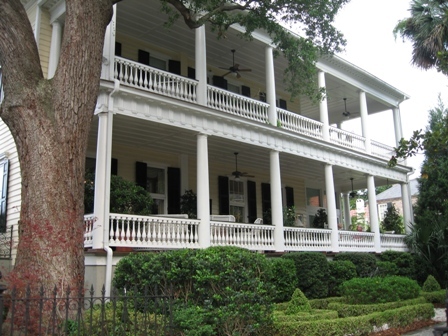 If you have seen the movie Cold Mountain with Jude Law, Nicole Kidman and Renée Zellweger you have a sense of what Charleston looks and looked like since it was filmed here. The Legend of Bagger Vance with Matt Damon and Will Smith was also filmed in Charleston in 2000. 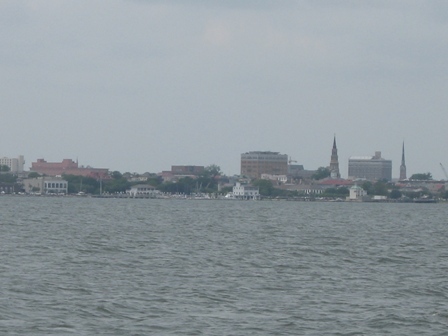 A look toward Charleston City Marina where we anchored off. 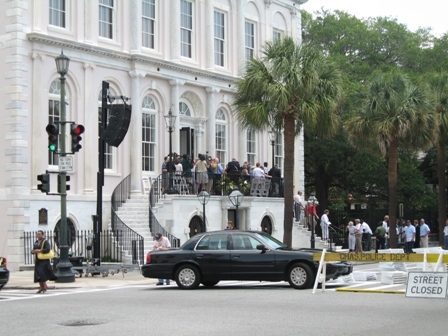 The Re-dedication of Charleston City Hall. Once Marco and I arrived in Charleston it didn't take us long to begin to stroll around the beautiful town. We ended up stumbling on the ceremony of the rededication that was taking place of the newly restored City Hall. There was quite a gathering here, including Mayor Joseph P. Riley, Jr. and a strong presence of Charleston's police force. The City Hall was built in 1801 initially as a branch for the Bank of the United States, replacing the City Beef Market, where all commerce had taken place from 1690 until 1796. It is reputed to be the second oldest city hall in the country. The building sustained four direct hit from Fort Sumter during the Civil War and in 1886 suffered severe damage from an earthquake. In 1897, a motion was made to either repair the structural damage or demolish the building. 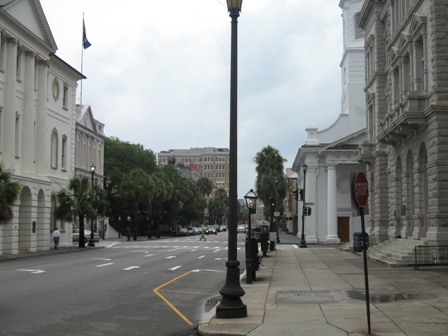 Since Charleston did not have the funds to do either they figured it was much more important to mask the underlying damage and to re-open quickly as a sign that Charleston was "open for commerce." The building suffered again in 1938 when it was the victim of a severe tornado. It was again recommended to demolish the building but public outcry scuttled the proposal. On September 21, 1989, Hurricane Hugo struck the city, causing significant damage once again to the City Hall. Reconstruction of the historic building began 3 years ago and has been restored inside and out to its 19th century appearance. We were able to tour the building and were able to take in the impressive art that the building now holds. 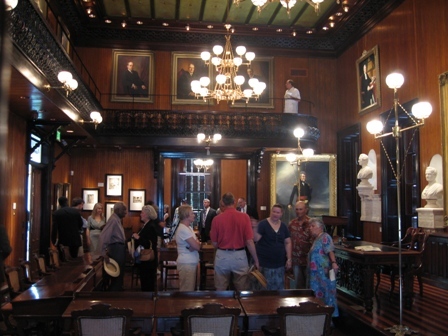 The room in the City Hall where the wonderful collection of Charleston art was located. 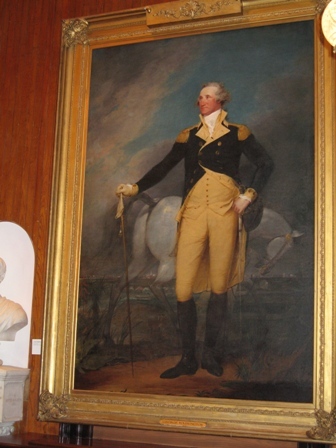 A portrait of George Washington that was displayed in the City Hall. This portrait of George Washington was painted by John Trumball and was commissioned by the city government in 1791 to commemorate the official presidential visit of Washington to Charleston. I have been reading the book, Founding Brothers, The Revolutionary Generation, and from it learned that Washington was actually 6'4" tall and weighed over 200 pounds. I don't know why but I always pictured him to be much shorter. It was fun to get to see this portrait of him, knowing now his full stature. 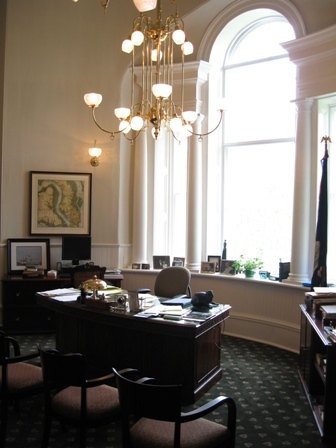 Mayor Joseph P. Riley, Jr.'s office in the renovated City Hall. 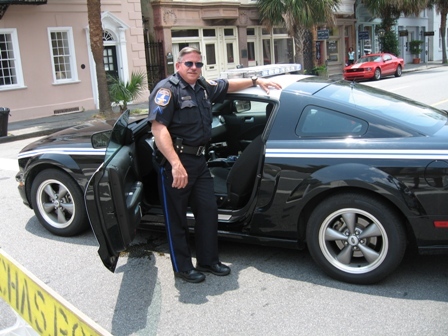 Marco asked one of Charleston's finest to pose next to his Mustang patrol car. Walking around the streets of Charleston we were able to see a city that typified southern style for us. The picture here shows the "four corners of law," which is at the corners of Broad and Meetings Streets. Clockwise from the left is: The County Court House, c. 1753, represents state law, City Hall, c. 1800, represents municipal law, St. Michael's Episcopal Church, c. 1761 represents God's law and the Post Office, c. 1896, represents federal law. 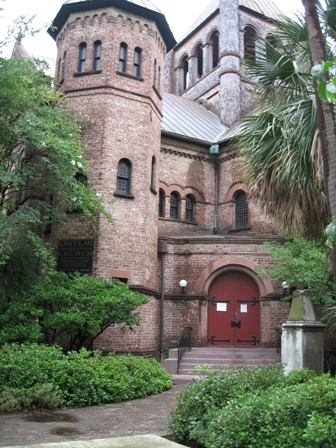 The Old Exchange and Provost Dungeon located downtown Charleston. The Old Exchange and Provost Dungeon has a long and important history here in Charleston. This building was paid for with the British pound and was completed in 1771. The Old Exchange is considered to be one of the three most historic buildings in America, because only three buildings remain from the ratification of the United States Constitution that took place in each of the thirteen original colonies. The two other buildings are Independence Hall in Philadelphia and Faneuil Hall in Boston. This building however even further back in history to the time of the 17th century when America began and Charleston was then known as Charles Towne. At this site a fortification was built to protect the Charles Towne citizens against the French, Spanish, pirates and Indians. A wall was constructed made of palmetto logs, (which later became the state symbol of South Carolina), and earth as was designed after Vauban who was a French engineer. This building was known then as the Court of Guard. The impeding vision of the wall repelled an attack in 1706 by a combined Spanish and French fleet, but it did not stop a blockade of the colony by the pirates Edward "Blackbeard" Teach and his apprentice "Gentleman Pirate" Stede Bonnet in May of 1718. One of Charles Towne council members Samuel Wragg and his son were abducted by Blackbeard and Stede Bonnet and were held for a ransom of sterling silver and medical supplies for the pirates crew. Charles Towne ended up paying the ransom but swore they would have their revenge, and succeeded in doing so the following November when Stede Bonnet was captured along with twenty-nine of his crew. they were all placed in irons in the basement of the Provost Dungeon and later hanged for criminal conduct. A portion of the wall of the original Provost Dungeon still exists today. Here was also the place that allowed for the colony to grow at a rapid pace where it was the center point of the active shipping and trade of rice, slaves and tobacco. Charleston soon became the number one port of slavery from the colonial through to the antebellum times. Slave trading took place on the northern side of the present day building which at that time until 1850 was known as the Royal Exchange and Custom House. In 1850 the city banned the slave trade due to "congestion problems." In the 1774 when tempers were high among the Charleston Patriots, they elected South Carolina's 1st Continental Congress here in the Great Hall. It was also here that in 1776 that South Carolina declared independence from England. 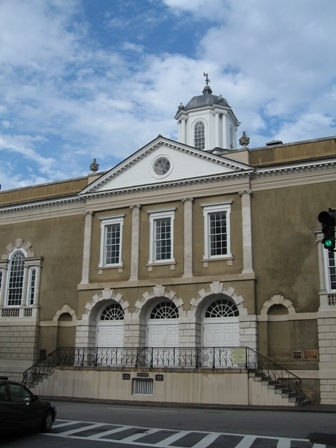 During the Revolutionary War, the British seized Charleston and took control of the Old Exchange. Arthur Middleton, who was a signer of the Constitution, and Edward Rutledge, the youngest signer of the Declaration of Independence, were both held here by the British in the Provost Dungeon, along with Christopher Gadsden, who was the one that designed the "Don't Tread On Me" flag and who was also one of the first to advocate separation from England in 1766. In 1788, in the Great Hall that the United States Constitution was also ratified. George Washington was also entertained here in 1791. By this time he was an older man and it is said that he attempted to avoid to dance with anyone. Legend states, however, that the unsurpassed beauty and charm of the over 250 elegant Charleston ladies was too much for Washington and he ended up dancing until the sun rose the next day. The Circular Congregational Church was the first Meeting House in Charles Towne and was erected in 1681. This is where the original colonists decided to dissent from the Church of England. The graveyard on the church grounds is the oldest in the city with headstones dating back to 1690. Walking though Charleston College Campus with Spanish Moss draped from the majestic Oak Trees. Spanish Moss in neither Spanish or a moss. It is a air plant that is in the pineapple family. The great botanist, Carl Linnaeus, named these plants as the genus Tillandsia, after one of his Swedish students. This student, Elias Tillands, got so sea sick that he once chose to walk more than a thousand miles around the Gulf of Bothnia rather than cross it in a boat. Since these air plants grew in trees, Linnaeus assumed they hated water and so named it after his student that also hated the water. It so happens however that Spanish Moss does like water but in the form of high humidity. 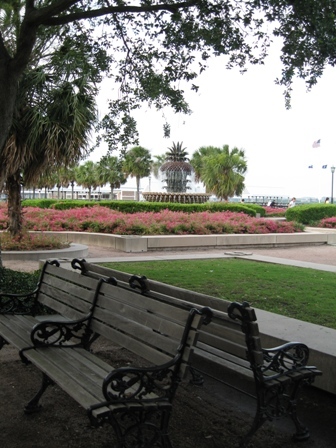 A walk along the waterfront in Charleston. 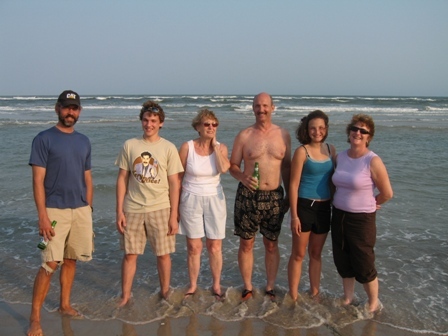 We could have spent much more time in Charleston but we were both very excited to get going to Beaufort to meet Jeff, Louise, Iain and Anna Shelley, and Louise's mom Jean, our great friends from Vermont. 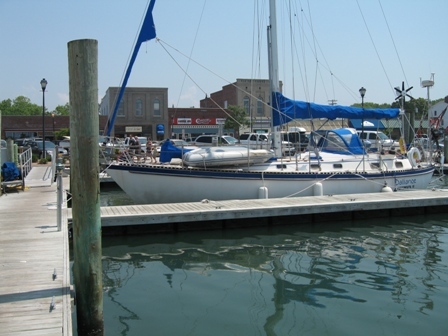 So on June 16th we departed Charleston City Marina and headed for Beaufort, North Carolina, another two day sail. Dalliance docked at Beaufort Docks. We decided to put Dalliance on a dock in Beaufort since we would be away at The Shelley's rental house in Topsail for a couple of days. The facilities were located right on Main Street with downtown just across the street. The gang finally back together!!! Marco, Iain, Jean, Jeff, Anna and Louise!! It was so much fun to get to spend time with The Shelley's again. 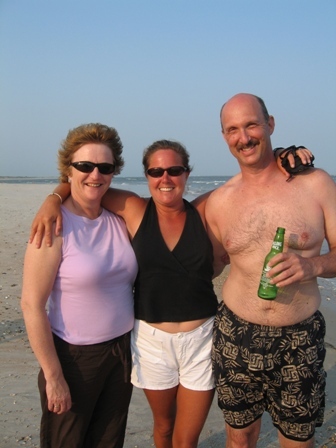 They have been friends of ours for many years and it was over a year since we had last seen them. 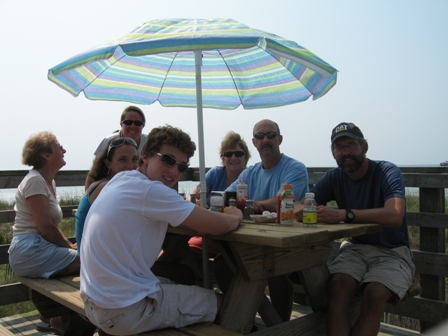 We ended up just hanging out, cooking great meals together, laughing, taking evening walks along the beach and catching up over the two days we spent with them. It was just like old times!!!! 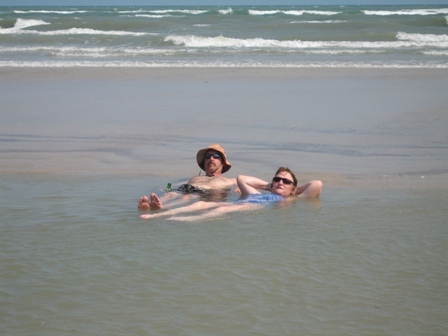 Jeff and Louise relaxing in the shallows off the beach, what a life!!! 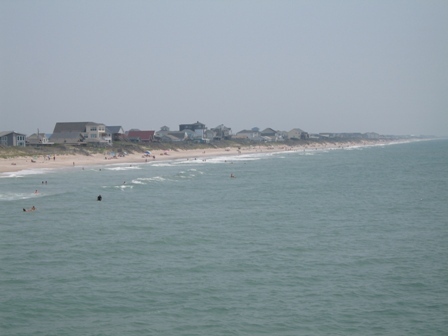 The shoreline of Topsail Island. 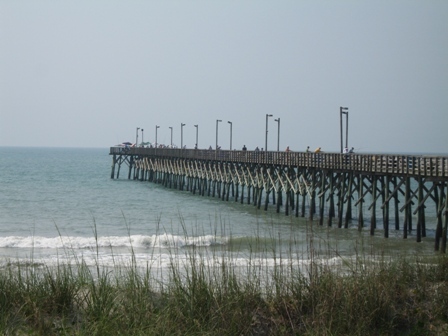 One of the many piers that are used to fish from where they were catching blue fish and scup. We did also get a chance to walk around the small town of Beaufort and take in a little history. 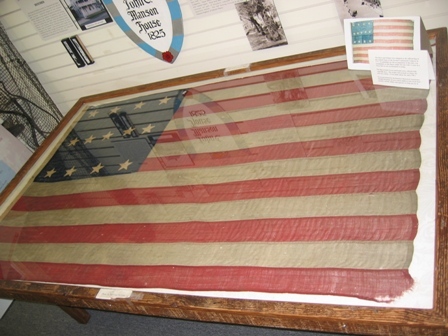 At the Beaufort Historical Association they had on display this early rendition of the American Flag. We found out that the Stars and Stripes were adopted as the official flag of the United States at the Second Continental Congress in 1777. At this time however, there were no guidelines for the arrangement of the stars, so this flag is unlike the one with 13 stars in a circle that we are accustomed to seeing. This flag is hand-woven and hand-sewn, colored with vegetable dyes. The stripes are made of linen and the stars made of cotton. This flag was made sometime in the mid-1790's. 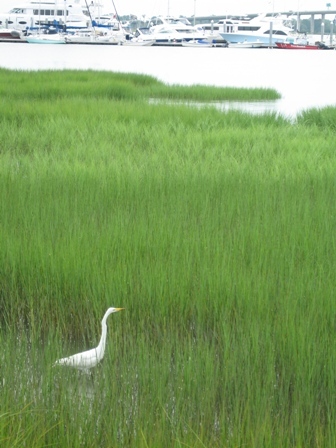 A Great Egret looking over the anchorage. The couple of days we spent with the Shelley's flew by and in no time at all it was time again to move on. Seeing them made us even more excited to get home and see all of our friends and family.